‘Once upon a time, a very long time ago now, about last Friday, Winnie-the-Pooh lived in a forest all by himself under the name of Sanders.’ A. A. Milne’s stories about Pooh and his friends have been loved by generations of children and their parents since Winnie-the-Pooh was first published in 1926. 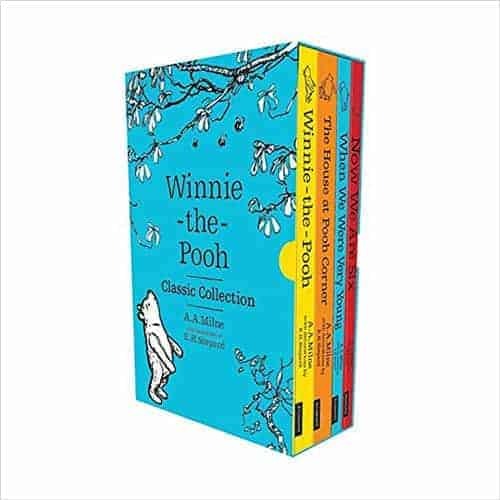 This magnificent slipcase features the four classic Winnie-the-Pooh titles: Winnie-the-Pooh, The House at Pooh Corner, When We Were Very Young, Now We Are Six. Each volume features the original E. H. Shepard illustrations in full colour. This delightful collection is the perfect gift for Pooh fans aged 5 or 55.